Setup Instapay and receive your money in just 30 minutes! 2. Confirm your identity information. You will need to enter your SSN and a clear photo of your U.S. Issued drivers license OR passport to verify you are the individual adding your debit card to receive instant payouts. Please note: You may need to wait up to 30 minutes for the identity verification to process. 3. Choose your default deposit speed. You can choose to have the standard 2-day deposits on by default, or you can choose to always deposit instantly. This selection will apply to all the card transactions and users in your company. If you toggle ON 'Use Instapay as default for cc payouts', all your card transactions will be paid out with Instapay. You'll be able to see your payouts underneath the deposits section moments after you take your customer's card. 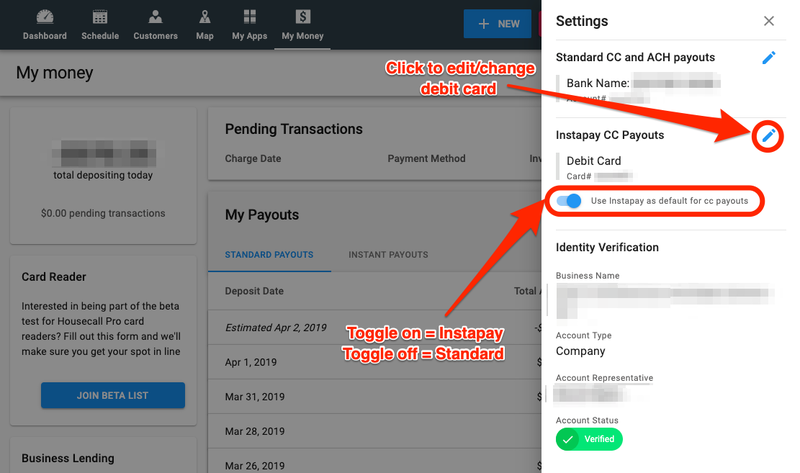 If you toggle OFF 'Use Instapay as default for cc payouts', all your card transactions will be paid out with Standard Payout. You'll see your pending transactions until they are deposited into your bank account. To learn more about reading your My Money page and payouts, check out My Money - Overview. 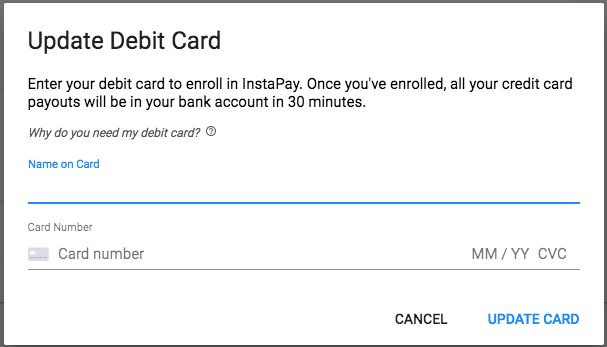 Learn how Instapay can have your credit card payment in hand in less than 30 minutes.